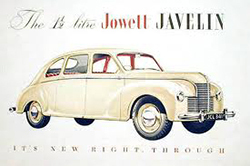 Before the production of the revolutionary flat-four javlin saloon in May of 1947, Bradford based Jowett were best known for their sensible flat-twin powered cars. Designed by Gerlad Palmer, the new car was an ambitious venture for the small manufacturer, and was one of the stars of the 1948 Earl's Court Motor Show. The Javelin's six-seater bodywork was of very high quality construction and the car had excellent performance for the period. It became a popular and successful sporting saloon, scoring many overall and class wins in international rallies and sporting events. Early competition cars suffered from a susceptibility to crankshaft breakage, a problem cured in 1952 when a new design crank was introduced. Gear box failures were also common and not just amongst competition cars. Escallating warranty bills for engines and transmissions, along with Jowetts costly involvement in racing, forced Jowett to increase the price of the Javelin. This caused a drop in demand resulting in the build-up of a large number of unsold cars and fully trimmed bodies at the factory. This brought the company to it's knees, and manufacture ceased in early 1954. The Javelin is a sensible buy for use as an everyday family car, with room for up to six adults in the roomy interior, The bench seat and column gearchange provide an uncluttered floor for front seat ocupants. Boot space within the shapely tail of the car is supprising and acces to the spare wheel is good, as it occupies its own compartment beneath the wooden boot floor. Unusual placement of the radiator behind the engine allows for excellent accesibility, and the flat-four can easily be removed with a trolley jack. However due to this arrangement overheating can sometimes be a problem. 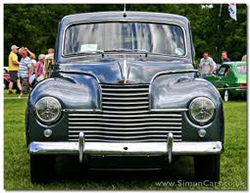 Most spares are available from the Jowett Car Club. Body panels are harder to come by, although good second hand ones can occasionally be found. Performance is spirited and handling is good, and those keen on competition will find the Javelin lends itself very well to the sport. These cars were very popular among competitive drivers in the fifties, and even today there is a keen sporting fraternity in the club. Any prospective buyer should be looking at the series III Javelin, with the updated engine specification featuring the redesigned crankshaft and improved oilway drillings (from October 1952). Although many Javelin engines will have been updated to incorparate the crankshaft revision. Corrosion blackspots include the rear of the chassis, torsion bar mountings and the rails supporting the wooden boot floor. Make sure to check for coolant leaks from the aluminium block, though oil leaks from the gear box can be regarded as 'normal'. Pre 1949 cars will have a hydraulic/mechanical breaking system. but the more desirable fully hydraulic system is on all cars produced after this date.